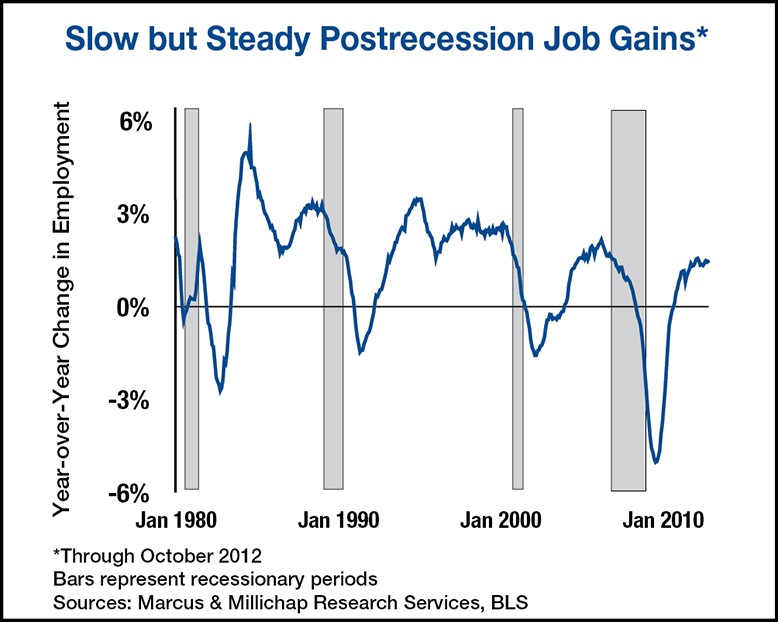 Hiring accelerated last month, though the rate of job creation remains modest relative to past recovery periods. Approximately 4.5 million of the 8.8 million positions lost during the recession have been recovered since the downturn ended, but continued uncertainty due to the presidential election and looming fiscal cliff continue to raise employer caution. As election results are tallied, additional clarity will emerge for many companies, providing them with sufficient information to make more hiring decisions. The effects of Hurricane Sandy, meanwhile, will create erratic unemployment claims and hiring trends over the coming weeks. With an estimated economic cost in the $50 billion range, rebuilding from the hurricane may provide a short-term regional stimulus that boosts construction employment. Private-sector employers added 184,000 positions last month, though the government reduced staffing by 13,000 jobs, generating a net addition of 171,000 total jobs. Also, the results for August and September were revised upward, generating 84,000 spots. Gains have been broadbased, with nine of 10 private-employment sectors expanding payrolls. Professional and business services led the improvements, adding 51,000 positions, of which nearly 14,000 were temporary. Manufacturers also expanded payrolls despite automobile and parts makers’ 2,100 worker reduction. With growth in China slowing and the eurozone largely mired in a deep downturn, automakers are once again focusing more intently on the domestic market. As a result, auto dealerships added 4,300 employees in October, contributing to a net gain of 36,400 retail jobs. Construction employment grew for the fourth consecutive month, the longest streak since 2006. Of the 17,000 construction positions created last month, the majority were in specialty trades, a category that includes foundation and framing contractors. The uptick in construction hiring comes on the heels of a 17 percent year-over-year increase in housing starts, and a broad-based stabilization of the housing market. The market appears to have reached bottom last spring, and since then values have risen by approximately 8.8 percent, broadening confidence that the worst of the housing market is over. National apartment vacancy edged lower by 10 basis points in the third quarter to 4.6 percent, and the strengthening demand appears on track to press vacancy lower by an additional 20 basis points by the end of the year. Though employment gains have been modest, they have been sufficient to create enough new rental households to surpass the 85,000 apartment completions this year. Further, many of the fourth quarter completions scheduled in the Northeast may miss their target completion date due to setbacks from Hurricane Sandy. Nearly all metros, however, will record much greater supply growth in 2013, limiting future vacancy tightening. Approximately 495,000 full-time office-using positions were created over the past 14 months, including 42,000 in October.m The gains provide the national office sector considerable momentum heading into the final months of this year and lift prospects for more significant demand growth in 2013. Through the first three quarters of 2012, nationwide office vacancy fell only 20 basis points to 17.1 percent and asking rents rose 1.0 percent. This entry was written by marcusmillichap, posted on November 6, 2012 at 12:13 am, filed under Research and tagged Commercial Real Estate, Employment. Bookmark the permalink. Follow any comments here with the RSS feed for this post. Trackbacks are closed, but you can post a comment.